The morphology of material of the acanthocephalan genus Telosentis van Cleave, 1923 from different parts of the Mediterranean basin is examined in order to assess the validity of T. molini van Cleave, 1923. A redescription of T. exiguus, a generalist species of fishes in the Mediterranean basin, is presented especially in relation to the number of proboscis hooks. The main characteristic of T. exiguus is a cylindrical or club-shaped proboscis, which is covered with 12 longitudinal rows of 14–19 hooks in males and 16–20 in females. Males and females differ in both body size and the number of proboscis hooks. T. molini is considered a junior synonym of T. exiguus. A key to the species of Telosentis is presented. 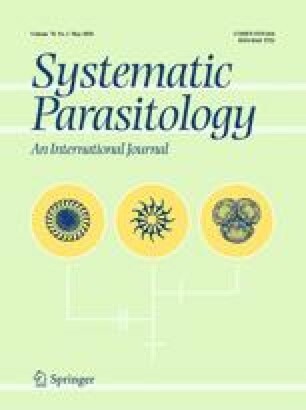 We thank Dr Tomáš Scholz (Institute of Parasitology of AS of CR, České Budějovice, Czech Republic) for his valuable comments.